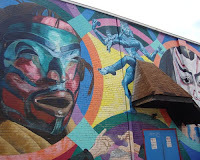 Little Five Points (L5P) has grown from an "alternative" neighborhood to a popular alternative neighborhood-shopping-entertainment destination. 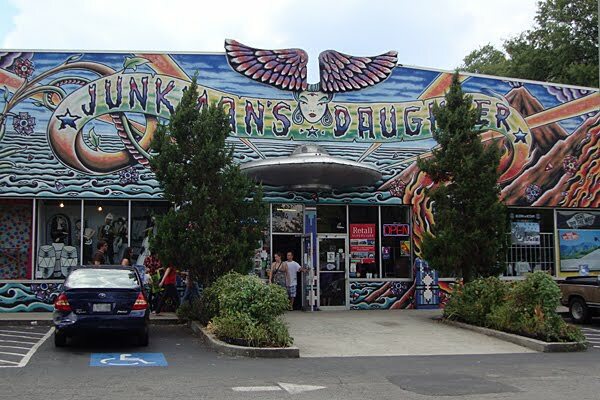 The anchor landmark, Junkman's Daughter, sports a UFO flying into or out of (I haven't been able to decipher which) its façade. It's a shop of eclectic, curious bobbles, collectibles and fashion. If you're working on a Halloween costume, consider this store to start or complete your look. Dining in Little Five Points takes the palette on a journey around the world. Options include tastes from traditional American fare to the spice-laden flavors of India. 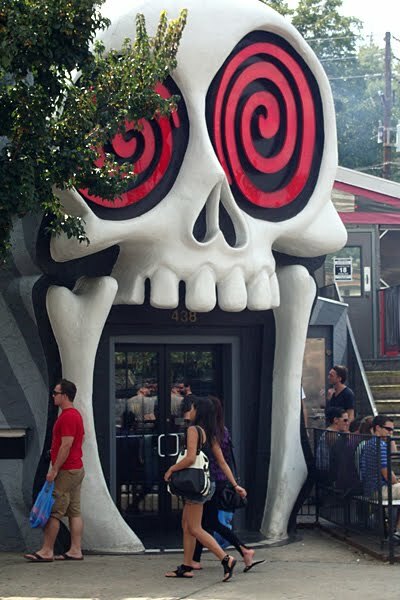 The Vortex, easily identifiable by its huge laughing skull entry, is extremely popular among L5P visitors. Also popular is The Brewhouse Cafe, which boasts seemingly as many big screen televisions as there are sports in the world, is continually playing any or all currently-being-played games…and you can be as vocal for your favorite team as you like. Theatre in L5P is abundant for such a tightly packed neighborhood. The long-standing 7 Stages Theatre and Variety Playhouse Theatre feature avant-garde productions as well as some closer to mainstream shows. Little Five Points features some of Atlanta's best murals—the art form, that is. Many of the would-be blank brick walls are covered with imagination-inspiring graffiti renderings, many indicative of the neighborhood in which they reside. A great escape from the typical city life, Little Five Points is indeed an alternative distraction. A coffee at Aurora, new trendy shoes from Abbadabba’s, a pendant from Crystal Blue, a hard-to-find book at A Cappella Books or a tattoo at Sacred Heart Tattoo may be just the diversion you need. The usual question: Will I return to Little Five Points? Yes indeed. On October 15-16, 2010, Little Five Points will host their 11th Annual "Little Five Points Halloween Festival & Parade." I’ve not yet attended one, but I’ve heard some "wicked" reviews, so I can hardly to pick out my front row seat (curb) to what is sure to be one of the best shows in town.